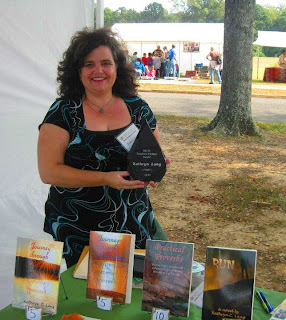 Sen. Clay Scofield presents Kathryn Lang with the 2012 SELTI Tourism Fiction Awardat the Moundville Native American Festival. Kathryn’s story won the Inaugural SELTI Writing Contest, the first contest in the nation that challenged writers to use fiction as a vehicle for promoting a real tourism attraction. The entries were judged by a team of University of Alabama English and marketing professors. Click the “Digging Up Bones” link above to read the story, which includes many photos of the real Moundville and tourism links related to the cultural attraction. Please check out the many tourism attractions found in books across the South in the Stories By Month archives to the left. When I was asked to present this award, I have to admit that my first thought was: “What is tourism fiction?” As it turns out, the concept is very simple: tourism fiction involves creating stories about real places and events—like this festival we’re all at today—and then inviting the reading public to come visit those places in real life, through short travel guides. Think about all of the fun places you’ve been to in this state, and then imagine that readers in Georgia, Florida, Tennessee, Mississippi, and all across the nation started reading about those places in short stories and novels. Then imagine that they could click on links to those real places at the end of the story and learn how to go there in real life, not just read about them. That’s what tourism fiction is. Now imagine what the impact would be on Alabama if all our writers were focusing on real tourism attractions in their stories across the state. Here in the South we’ve always had the nation’s best storytellers, but in these difficult economic times, our storytellers might even help the state by attracting more tourists. In order for tourism fiction to work best, lots of people have to work together. The idea came from the Southeastern Literary Tourism Initiative—SELTI for short. The key part of SELTI’s name is the last part: “initiative,” because many other people and organizations have taken the initiative this year to help SELTI promote Alabama tourism through fiction. When the Alabama Tourism Department first heard about SELTI, they took the initiative in telling the rest of the state’s tourism attractions about tourism fiction through their state-wide newsletter. When the staff at Moundville read the newsletter, they took the initiative to reach out to SELTI and design a short story contest to promote Moundville. That contest, the Inaugural SELTI Writing Contest, was the first in the nation that challenged fiction writers to promote a real tourism attraction: Moundville. When writers around the state heard about the contest, they took the initiative to apply their unique talents to promote this special place through stories set at Moundville. When the entries came in, English and marketing professors from the University of Alabama took the initiative in accepting the challenge to judge the stories and determine a winner. The winner is here with us today, and her short story captured everyone’s attention as soon as they read it. In fact, an important part of her story described the dance performance that we just witnessed on this stage. Her name is Kathryn Lang, and you can still read her short story online at SELTI in the May 2012 feature. Before I present Kathryn with the 2012 SELTI Tourism Fiction Award, I would like to take a moment to ask all writers to consider featuring Alabama tourism attractions as settings in their works of fiction. Our state has so many wonderful attractions to inspire writers, from beautiful sunny beaches in the south to scenic mountain getaways in the north, from large cities with unique museums and theaters to small towns with personal history and charm. I hope all writers and publishers in this state will follow Kathryn’s example in helping to not only tell a great tale but to promote our great state at the same time by inviting their readers to come visit a real place in Alabama. The next town featured might be your home town or city. The new e-books you kids are starting to read now can do some amazing things that paper books could never do when I was growing up. Some of you may become famous writers someday soon, so I hope you’ll all consider including real places like Moundville and others that inspire you in your work. this award, the first tourism fiction award in the nation, on behalf of SELTI and on behalf of the state of Alabama. We wish you well in your writing career and hope that other writers follow your path to promoting Alabama through fiction. (Listen to more from Senator Scofield and Kathryn Lang by clicking on this Alabama Public Radio feature on literary tourism and the Moundville contest: Alabama Public Radio feature.